"All you do is hit up, up, left, right, right, right, down..."
"My rapid moves are becoming literal!" That one bit of missing pixel on the Cybunny's right (our left) leg is really REALLY bothering me. I guess it looks nice, but like... where is the light source coming from? Water is fabulous. 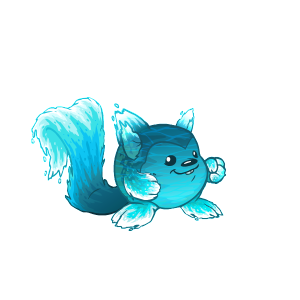 I kind of wish they'd go for some green hues in the water, but this is so much better than the water Peophin, which was outright sad. 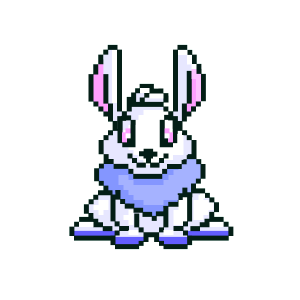 8-Bit Cybunny: This is super cute! I can actually picture this hopping around in a video game. It also seems to follow the color restraints pretty well. Though I do agree with greeneggsandgraham - the light source is really unclear. I think it's coming from the right and the other shading's supposed to give depth, but it's really not needed. Water Meerca: I love the rushing water texture here, a very nice touch that gives a lot of movement. I feel like the body could have done with some more transparency or some really strong highlights to give a better sense of depth, but it's not that big of a deal. Well done overall. That 8-bit cybunny is adorable. They're doing a great job with the 8-bit pets at the moment! The Cybunny is too cute! <3 The Meerca's waves are nice and dynamic-looking, it's a great effect (though I can't say I'm a big fan of its feet or hands).